Celebrate Thanksgiving with cute place cards – they double up as favours and place settings. Ask your guests to write a few things that they’re grateful about and share your suggestions around the table. It makes for a lovely game between courses and can work as a fab ice-breaker. You can never go wrong with a chic white and gold tablescape – it’s the perfect combination of elegance and glamour. 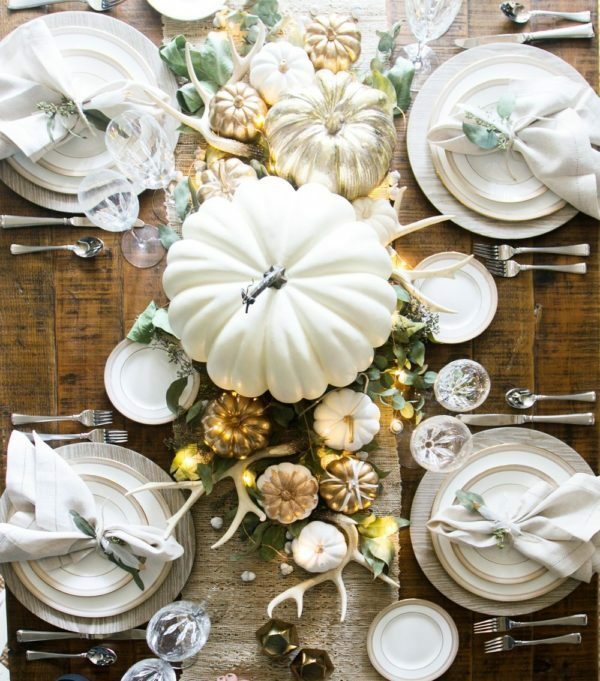 Style your Thanksgiving table with white and gold pumpkins in various sizes. They’ll look striking lined along the length of your table. Pumpkins are a wonderful addition to any Thanksgiving tablescape – especially if you’re serving up pumpkin pie for pudding! You could use a sequin gold table runner for an extra sprinkle of glitter. Opt for white plates teamed with golden cutlery for a fabulous finishing touch. 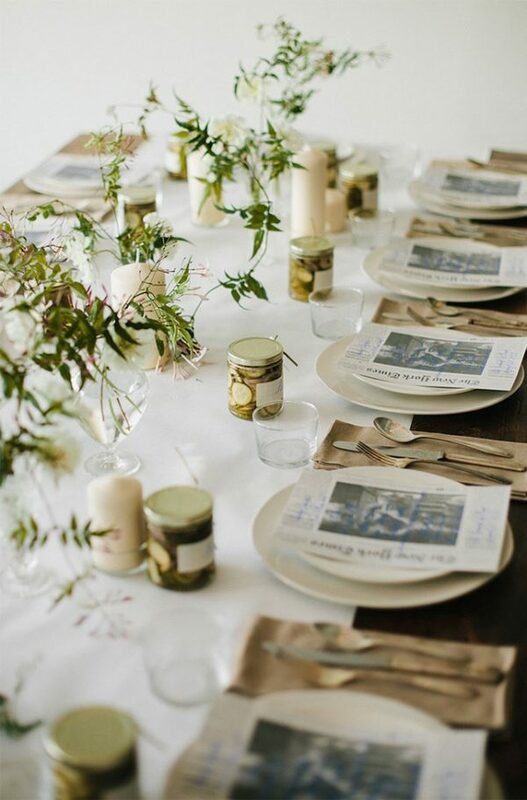 Add a rustic touch to your table with a hessian tablecloth or runner. Work in lots of flowing greenery and foliage to transport your guests to the countryside – even if you’re celebrating in the city! Provide your guests with miniature jars of homemade jam, chutney and pickle. It’s the perfect party favour for your guests and it’s a thoughtful reflection of the traditions behind Thanksgiving. You’ll definitely be the host with the most! 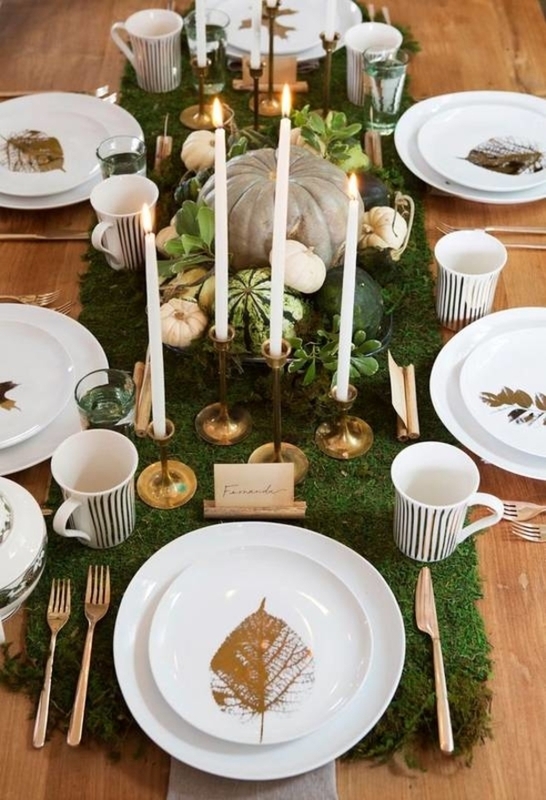 Dreaming of a woodland-style Thanksgiving tablescape? Then a dried moss table runner is a fab fit for your table décor. Line along the length of your table and nestle in a few antique gold candles and some small pumpkins. 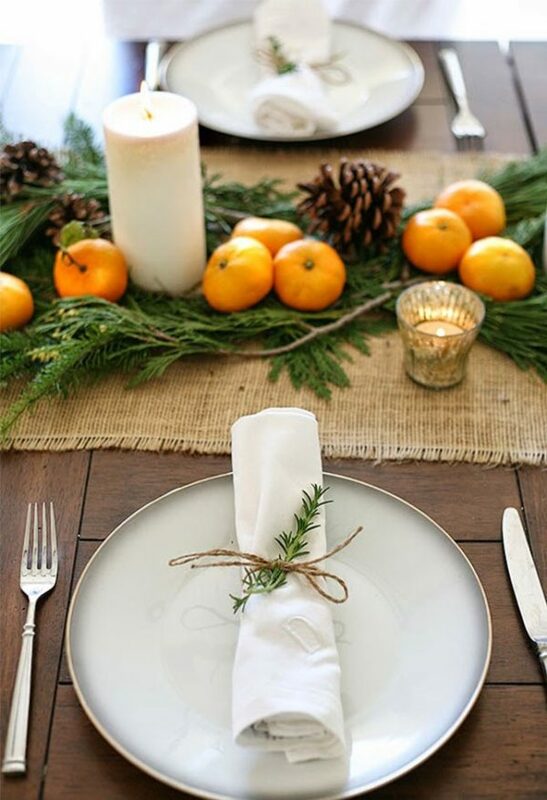 You could also opt for rustic wooden tree slices as alternatives to place mats. 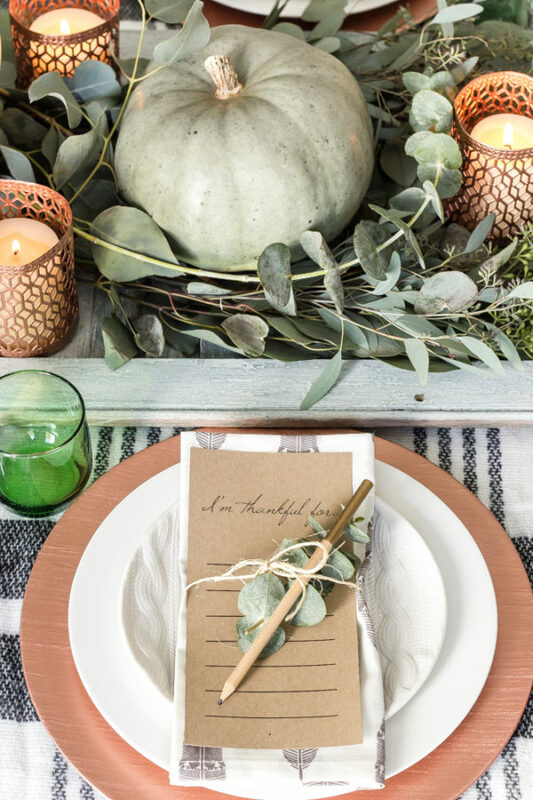 Give your place settings a pop of colour with some Thanksgiving table stationery. 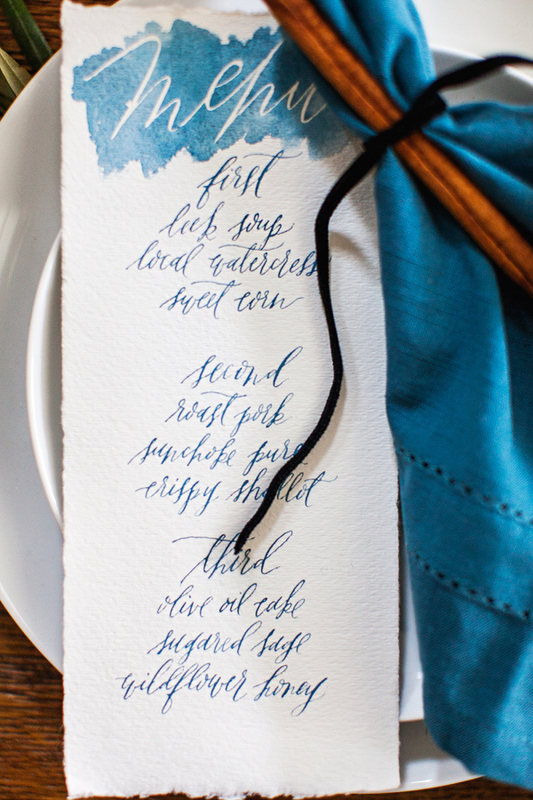 A watercolour menu is the perfect way of giving your guests a clue about what you’re going to serve up! Opt for place names in the same design for a table with the ‘wow’ factor. 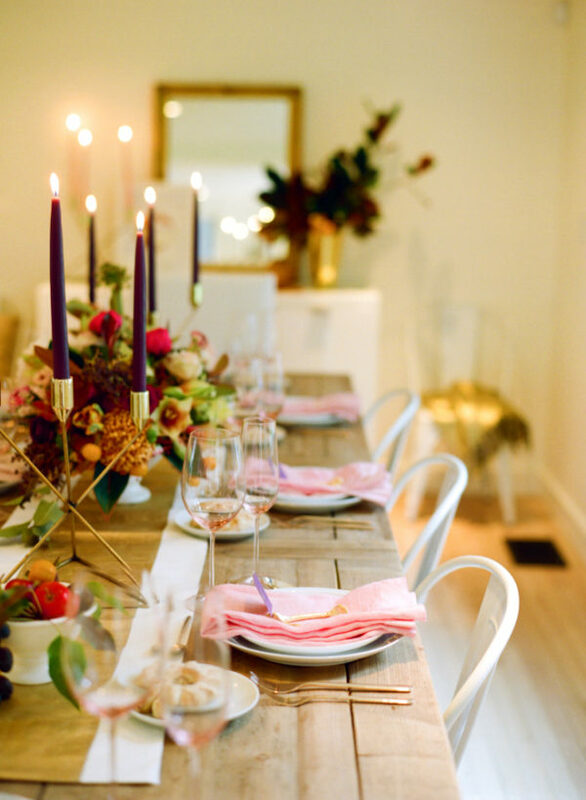 What could be prettier than a burgundy and blush Thanksgiving tablescape? This gorgeous colour combination fits in beautifully with the season while looking oh-so-elegant. Tall burgundy candles in golden holders will add a dash of decadence to your table décor, while delicate blush blooms will look stunning in golden vases. Finish the look off with pale pink napkins tied with a burgundy ribbon. Perfection! Copper is the metal of the moment. Whether it comes to Thanksgiving tables, wedding themes or Christmas parties – this chic metallic is everywhere and we love it. 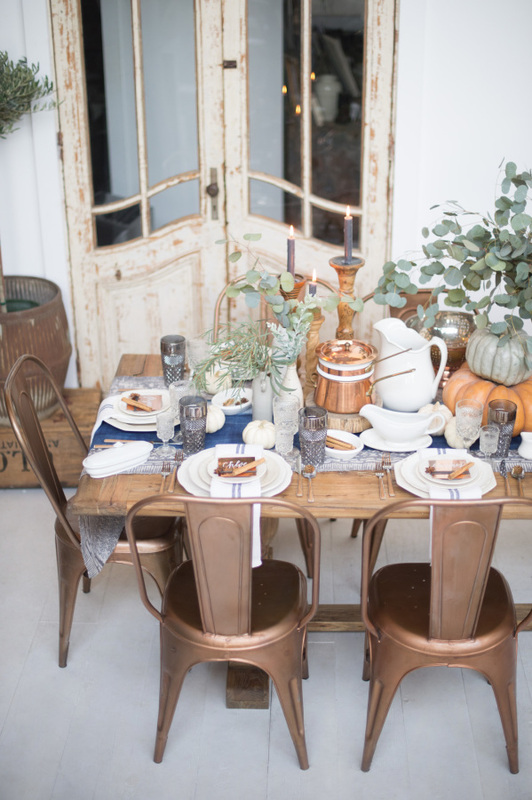 It’s incredibly easy to decorate your table with copper elements: simply opt for copper charge plates, metallic candle holders and even copper tolix chairs. Your Thanksgiving celebration will look ultra-stylish, trust us! 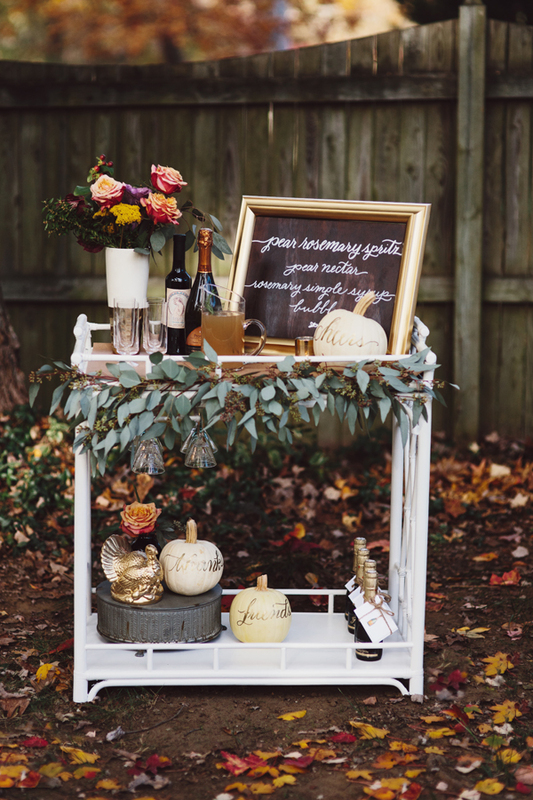 Add extra impact to your Thanksgiving celebration with a chic cocktail bar-cart. Create a self-serve drinks station with flavours that fit in with the season – your guests will love this idea! We’re suspect you’re going to be serving a few pumpkin pies at your Thanksgiving celebration, so why not create a dessert table? You could create a mixture of pies, fruitcakes and a bowl of candy that your guests can help themselves too. 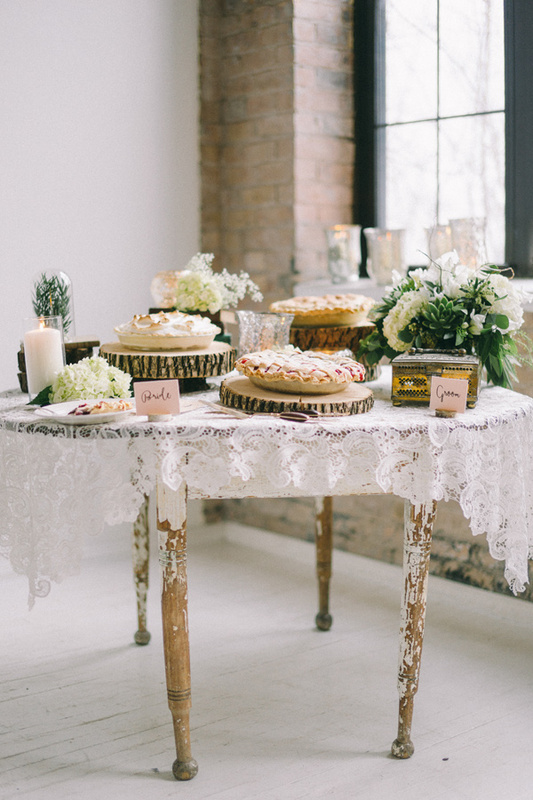 Match your dessert table to the style of your main table décor.